Name a trait you share with your parents or your children. List 3 qualities of a good leader, in your opinion. 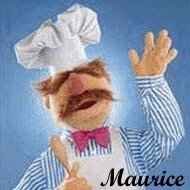 Who is your favorite television chef? Share a story about a gift you received from someone you love. My maternal grandmother gave me her diamond engagement ring. She had replaced it with a larger ring years before, but this was the one my grandfather chose for her out of love. She gave it to me in the wake of hearing that my younger cousin was engaged. I wasn’t upset, but I think she expected me to be, and wanted me to have her diamond in case I never got one of my own. It is something that is beyond precious to me because it represents the love and devotion my grandfather had for my grandmother -- and also her love & devotion to me since she gave it to me. I don’t mind doing things under pressure. The type of pressure makes a difference though – did I put it on myself, or is the source out of my control? I usually deal better when I haven’t created the pressure, but need to react to it. Good Morning! Good list and a teriffic story! My feast is served. I love the story of your ring. It's beautiful and such a treasure. I found you through the FF homepage, and have enjoyed reading through it. I also homeschool my 9 children.